I am a big fan of the Football Manager series, and I think that in many ways the new 2012 edition is one of the best versions of the game to be released for a few years. However, in my long-term career game I am starting to reach an impasse where I am going to struggle to achieve my desires. I am playing with The New Saints in the Welsh Premier League, a league with a single star for reputation and a team with a reputation limited to Wales. My long-term aim is to enhance the reputation of the league, and of TNS and to hopefully take them to Champions League glory. 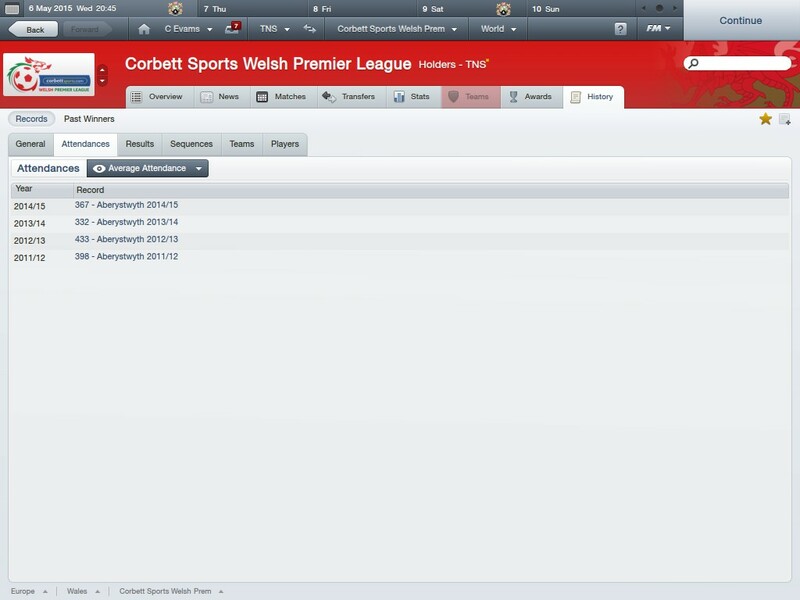 I came across one major stumbling block in my aims quite early on when I noticed a low attendance for a Welsh Cup game. In fact, I only had 12 people turn up to see my match against Llanelli. This immediately struck me as odd and I proceeded to do some investigating into the attendances for the Welsh League and the Cup. In my last league home match as TNS I played Aberystwyth with an attendance of 208, the above link shows the real attendance was 363. It seems like all the attendances in the Welsh League are wrong. The head researcher for Wales has said that the attendances will be altered for a future patch, but during my current game they are proving a big hindrance. I have one the league in my first three seasons in charge, in my second season I got to the group stage of the Europa Cup, and in the previous season and my current season I am in the group stage of the Champions League. This should surely improve the attendances overall, and the reputation of the team, but it doesn’t seem to be having a large effect. My league attendances have remained largely flat, and due to stadium limitations I am only able to get a maximum crowd of 1000 for European games. Of course, the board won’t think about expanding or building a new stadium due to the low attendances, even though it seems likely that we would draw strong crowds for our European matches. The other issue which is starting to appear is players itching for a move to a bigger club. The majority of them are unlikely to attract interest from any English teams playing in Europe, indeed only teams from League 1 or 2 are likely to be interested. 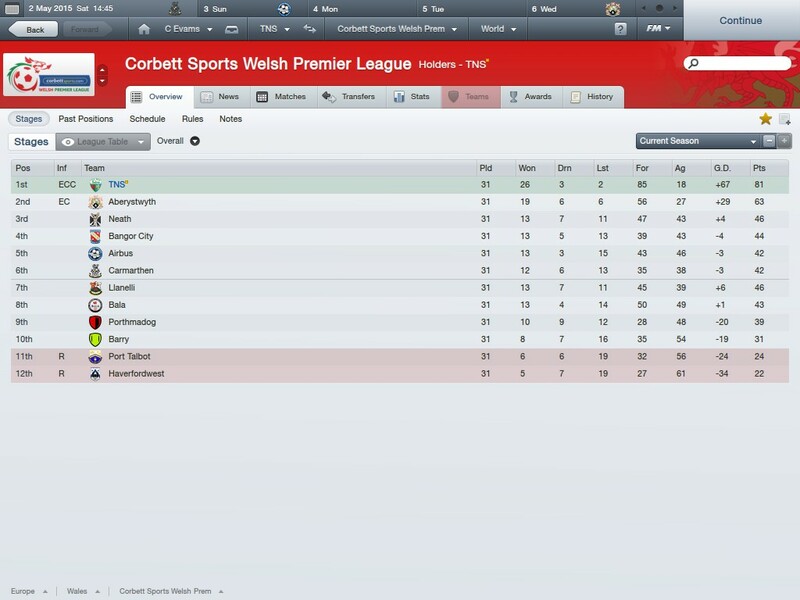 While the reputation of the Welsh League isn’t great, surely the lure of playing in the Champions League every season would be enough to persuade them to stay with my plucky little TNS? Further problems arise when I try to sign new players, I am often unable to get players from League 1 or 2 to even start contract talks with me, and talented youngsters from Brazil and Argentina are refused work permits to play for me. 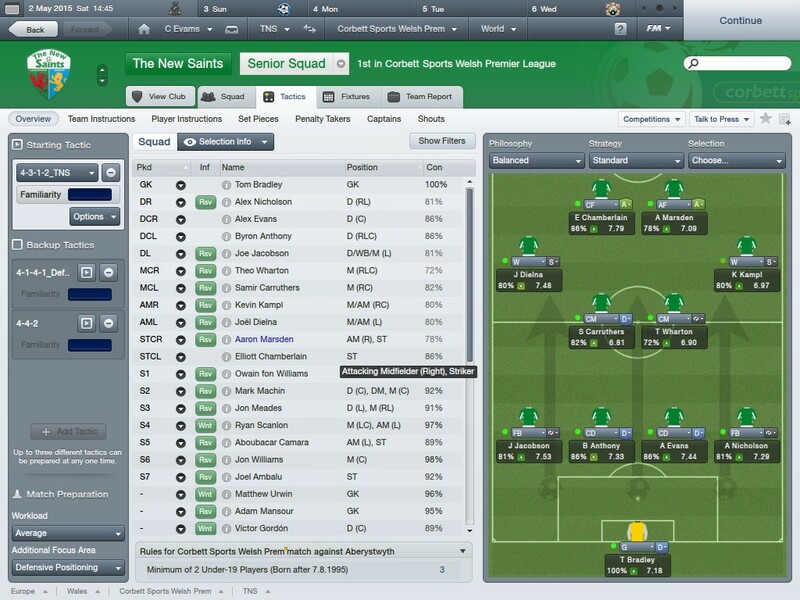 If my top stars demand moves away from the club, I worry about my chances of recruiting enough quality replacements. Now for the impasse, somehow my managerial reputation seems to be far outdoing the reputation of TNS and the Welsh league as I am getting linked to jobs with teams like Aston Villa and clubs in the top divisions in Germany and France. The temptation to take on a new challenge is difficult to resist, but I still want to achieve all I can with TNS. I fear though, that with the restriction on expanding my stadium, and the slow rise in club reputation, I am going to lose my best players with little chance of finding worthy replacements. I sincerely hope that the attendance issues are resolved with the next patch, for the entire Welsh system to have extremely low attendances compared to real life is frustrating and is now starting to impact on my enjoyment of the game. I will persevere for now. I hope they sort this out for you soon. While I haven’t played a management game for a number of years, I’ve always felt the most fun is to be had turning a plucky side from the lower divisions into a powerhouse. Thanks to CM2, I’ll always have a soft spot for the likes of Ross County and Mansfield Town.